Mounting the thermistance: it just must stay in place! Actually, I am not sure I like the official way to clamp the thermistance on the aluminum block. How the themistance is clamped (from the manual). As shown on the picture on the right, the wires are pinched by a washer. There is no real way to now if the screw is tightened enough. Reciprocally, the wires would be crushed if the screw gets tightened too much. Also, without any elasticity left I fear that the clamped cables of the thermistance could eventually break (see below specifically). Now, true, the thermistance must absolutely stay in place when printing, or it will record lower temperatures. This, in turn, would overheat the cartridge to the point it may provoke a fire (the issue is the same with the heater cartridge). Most recent printer firmwares implement software protections to shut the printer down when the temperature readings behave abnormally: either because there is no reading (e.g. cable cut), or because the temperature does not raise after the power is send (i.e. sensor out of the aluminum block). But... if the thermistance is half way out of its slot, the raising dynamics are still OK and there are readings. But the temperature may appear to be much lower than in reality. 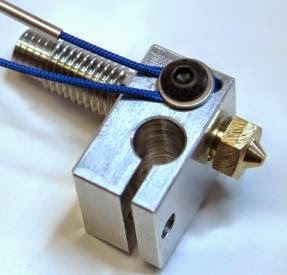 So this is why it must stay fully in contact with the heating part of the hot end, and it is better to screw more than not enough: either you tighten the holding screw and risk damage to the thermistance wires, or you screw it loose and risk the thermistance to pop out of its hole when the screw gets loose. Easy fix: drop a bit of silicon on the screw thread so elasticity keeps it in place. Note that the usual risk is almost identical with the heating cartridge, but it is prevented with the E3Dv6 design. The way the cartridge is clamped makes it almost impossible to slip out. And the feature is even nicer because it also increases the quality of the contact surface with the aluminum block (which gives a better heat conduction). Serious havoc at my fablab on an E3Dv6 : in less than a minute, the aluminum block started to melt! and missing safeties (old firmware that did not include useful paranoid tests). So I added a bit of heat-resistant silicon to the thread of the screw, and filled the thermistor hole itself with high temperature silicon glue, before I inserted it. There four reasons to do so in my opinion. First I had this nice high temperature Silicoset 158 idle around (bought at Farnell). Then, silicon conducts heat better than air for a better response (air is an excellent insulator!). It may not be significant though. Then, it reduces movement further (I do not like glass-thermistors, I used thermocouples until now, mostly because they safely go above 300°C) . And finally, once cured, the silicon will prevent any short cut with time, in case the blue glassfiber sleeving did expose naked wire at the base of the thermistor when I inserted it. Best would have been to glue all this part before it is put in place to make it certain (as for now, just check that no short occurred with a multimeter). As usual on a 3D printer, cables move forth and back millions of time. If ever a cable is bent at the same tiny place all the time, it will eventually break. This is a very common problem that must be dealt with extra care: try to "diffuse" the bending on the biggest length of the cable, and/or on a part that just does not care about the stress level (e.g. chassis). There are years of research done on metal fatigue. Crimping, when done right, is faster and probably better than soldering (see plugs?). That's the use of the provided ferrules in the E3D (see, no solder?). Well, in fact I did solder very lightly the two wires before I flattened the ferrule, to prevent any chance that the cables slip on each other, but without the solder point to protrude from the ferrule (it would ruin the usefulness of stranded wires, actually making them behave like a solid core). With a life-changing proper crimp tool I would not have used solder at all. The documentation then safely insists that all the cables need to be tied together for a better strain relief. But... the tie itself is kept loose! The whole still moves forth and back slightly when printing. The places where most of the stress is dissipated then depends on the way the cables are bundled together. In any case, it accumulates on the "fixed" (aka weak) points in the setup. In the E3Dv6, the most fragile part of this head is probably again the tiny thermistance wires (note that I still consider this head to be the best). Without any elasticity left here, I fear that they may break where they get out of the the washer that clamps them. In my setup, I tried to solve the issue with the help of another feature I usually add on my hot ends (more here). All-metal hot heads like the E3D need active cooling, which is most often achieved by the addition of a fan. I once tried and failed so far to cool efficiently with a remote pump and a tube (as it may be lighter and less bulky than a fan)... Meanwhile, I managed to break two or three fans because of a waved screwdriver or so... The fins just fly so quickly around and a fan guard is a good thing for me. so no stress is propagated to the hot end cable connections at all. Or could E3D add a screw holes or a hook on their next polycarbonate fan duct ? In the above picture, the cable set is zip-tied to the fan guard. I left a significant length between the tie and the head components (cartridge and thermistance), which does not move at all. The stress will be diffused in the main body of the cables, but next time I should clamp the fiber-glass tube itself, so it handles most of the stress itself in place of the cables. My best wish for a v7 would be that they include a tapped hole directly in the top of the heatsink for example, so that the cables can be tied to the heatsink and not left loose as here. Screw holes or a hook would be nice on the blue fan duct alternatively (it requires a change to the probably expensive mold they made). Clean and safe cable routing along the duct. They stays safely out of the heater and of the fins. This blue duct is beautiful (esp. compared to the former ABS printed one that broke easily). It is also very rigid and snaps on the heatsink very well, as it is made of polycarbonate (I think so). I could not use the stock screws that are too short for an additional fan duct. But it is probably not recommended to use longer metal M3 bolts as I did: I highly recommend tapping the holes first else the screw may crack the duct (mine still holds well). Heating the screw would probably make easier, as tapping is tricky in this material. Finally, as you saw, all my cables are protected by a classy glass-fiber sleeving, with some room inside. The only drawback is that my forearm itches me now... I would probably better use a soft silicon hose instead, which it is both elastic, and durable, and which withstands high temperature. May be I try a dumb latex hose next time, that was left after experimenting with peristaltic pumps. This outstanding material deserves some more use. Conclusion. What could be better? All these are very minor tweaks and remarks I have for this remarkable piece of engineering. I love the E3Dv6. Better be up to its quality: that is why I took the time and wanted to make sure it is was properly assembled, with some extra-care ad may be a few ideas to share. 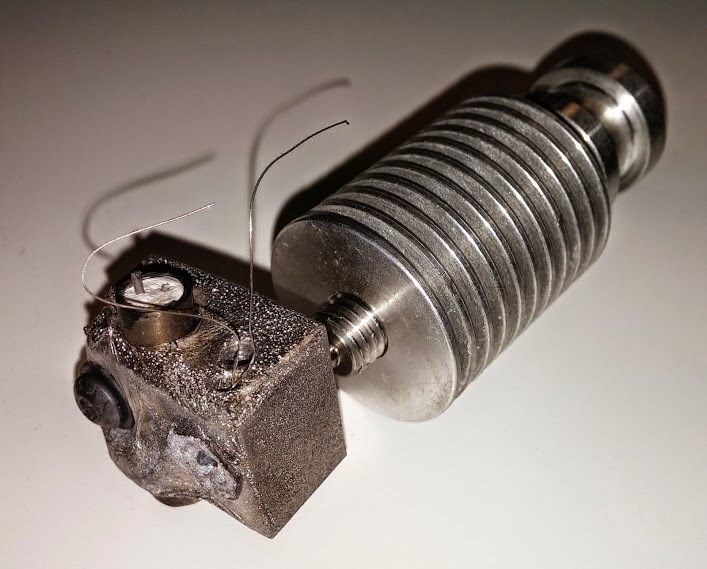 I still would like to have the barrel drilled 0.1 mm larger for my different set of filaments, as friction is still high when the hobbed bolt leave deep marks in them (the filament shape may get "damaged", which in turn slides with difficulty until it reaches the melting zone). As a point of comparison, my homemade all-metal hot ends were quite successful with slightly larger internal diameters. The last functional improvement I can think of, besides the cable tie, is a stainless-steel housing. Or a flat thermal barrier at least, between the alu block and the heatsink (next time I would also add thermal grease on the barrel to improve heat conduction). I stressed the stainless steel trick out in my former post about hot ends: they can then be made smaller, with a better regulation and so. The fan could be troublesome though, as 20 mm diameters are both less efficient and noisier (i.e. almost useless). There is always room for improvement and I am sure they will manage to make the v7 even better.